Have enough power to agree to all steps to take leading to a buy decision. Do not have the power to buy, nor do they have the power to cause a decision to take place. They are influencers at best. May favor the competition or view the seller as their competition. 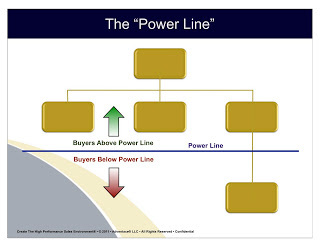 In the next post on this subject we will look at the significant negative organizational impact of calling “Below the Power Line”, and how managing top-down to the A/B Ratio can help. In the final post we will look at the specific, integrated steps that sales executives, sales managers, and sellers should take to resolve this issue.